Fine Art in Etiwanda? ….You Betcha! Drop by on the weekend, it is close to home in the west wing of the Joseph Filippi Winery. This is a very active association, the exhibits change regularly, check their calendar. This is a real treasure to our community. 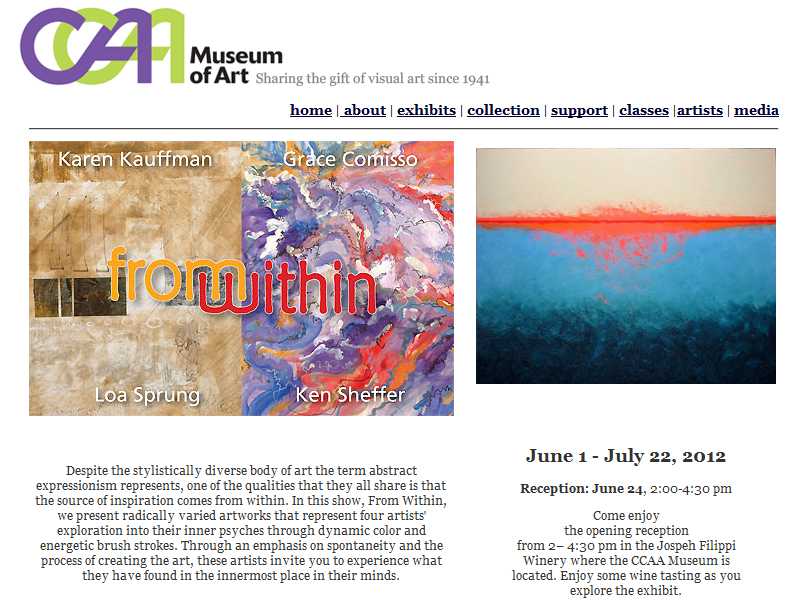 If you need to release the stress after a hectic SoCal day, step into the quite art gallery and focus on the complexities of color, line, texture and let it inspire you. Chaffey Community Art Association (CCAA) was founded in the spring of 1941 by Francis and Helen Line of Ontario, CA in memory of their daughter Barbara who died of Leukemia at the age of eight. CCAA is among the oldest organizations in the Inland Empire dedicated to stimulating and fostering an interest in the California School of Artists as well as other local artists. They maintain the CCAA Museum of Art’s permanent collection, arrange special exhibits and receptions as well as organize art classes. Sorry to see the CCAA Museum of Art move from Etiwanda. They will be opening a new gallery in the historic Ontario Electric Company building on Lemon Street in Ontario. They plan to open late spring 2013.